Walter John Abbott, the son of Caroline and William Abbott was born in 1880 in Rugby. He was baptised at Newbold on Avon on 14 March 1880. His 4 older brothers were born in Rhyl, North Wales. By the time Walter was one year old his mother (born Newbold on Avon) was a widow and the Inn Keeper of the Globe Inn, 53 Railway Terrace, Rugby. She married Thomas Middleton in 1883 who became the Hotel Keeper and they had several more children. In 1901 Walter John Abbott was a servant Grocer’s Assistant in Pershore, Worcestershire. In 1911 Walter Middleton was living in Louth, Lincolnshire with his wife Kate Isabel, born in Burton on Trent and two children Cynthia and Edward. He was a grocer’s traveller. Walter John Abbott served as a gunner (No. 152488) in “D” Battery, 199th Brigade, Royal Field Artillery, under the name of Middleton and was buried at Tournai Communal Cemetery Allied Extension. ABBOTT in loving memory of Gunner Walter John Abbott, fifth son of Mr and Mrs Middleton of Watford (late of Rugby) who died in France on 5 January 1919 from injuries received in a train accident while coming home on leave after four years service aged 38 years. “Thy will be done”. Horace Alfred TILLEY was born in Beckenham in 1898. He was the elder son and second child of Alfred ?Horatio Tilley, b.c.1870, in Greenwich, and Mary, née Rickards, Tilley, also born in Greenwich in about 1876. Their marriage was registered in Lewisham in Q4, 1895. Horace’s birth was registered in Q2, 1898, in Bromley, Kent. The family had moved to Beckenham, Kent, where their four eldest children were born and then to Weybridge, Surrey, where three younger children were born. In 1901, the family was sharing a house at 28 Cherry Lane, Beckenham. Alfred was a domestic gardener. Before 1911, the family had moved near to Rugby. In 1911, Alfred, was a ‘head gardener’ and he and Mary had been married 15 years – and all six of their children were still living. The family were living in Newton Road, Clifton upon Dunsmore, near Rugby. Horace was 13, so he would be only 16 when war broke out and whenever he ‘joined-up’, it would another two years before he was old enough to serve abroad. Before the war, Horace worked in the Controller’s Department at the B.T.H. In November 1915, Horace was mentioned as a ‘Single Man’, who had signed up under Lord Derby’s Scheme. The CWGC site gives the Service Number: 212890 for an H. Tilley who was killed on 27 September 1918. However, the Medal Card relating to this number is for a ‘George H. Tilley’ of the Royal Field Artillery. There are no death records from the RFA relating to a George Tilley, and it must be assumed that this was a clerical error. He was, at least latterly, in the “D” Battery, 52nd Brigade, Royal Field Artillery, as a Gunner, No: 212890, Royal Field Artillery. The four – L to LIII (Howitzer) Brigades of the Royal Field Artillery (9th Divisional Artillery) – were formed as part of the raising of the First New Army, K1. They are also sometimes shown as 50 to 53 (Howitzer) Brigades RFA. LII [or 52nd Brigade] was originally comprised of numbers 166, 167 and 168 Batteries RFA and the Brigade Ammunition Column. It was placed under command of the 9th (Scottish) Division and went to France with it in May 1915. In February 1915 the three six-gun batteries were reorganised to become four four-gun batteries and were titled as A, B, C and D.
On 21 February 1916 D Battery left to join 53 Brigade of the same Division, … The Brigade left 9th (Scottish) Division on 8 January 1917 to become an Army Field Artillery Brigade. Various other re-organisations occurred, and it has not been possible to find all the areas where this Artillery Brigade was in action in late September 1918 – although a War Diary for a transport section is available from the TNA. Thus the details of Horace’s death are unknown. He was buried in Plot ref: II. C. 16 in the Dominion Cemetery, Hendecourt-Les-Cagnicourt. There was no age or personal family message on the gravestone. Hendecourt-les-Cagnicourt is 16 kilometres south-east of Arras … The Cemetery is 2.5 kilometres north-east of Hendecourt-les-Cagnicourt, in fields reached by a track signposted off the road between Hendecourt and the Arras to Cambrai road. Hendecourt-les-Cagnicourt was captured by the 57th (West Lancashire) and 52nd (Lowland) Division on the night of the 1-2 September 1918. Dominion Cemetery was made by Canadian units in September 1918, after the storming by the Canadian Corps of the Drocourt-Queant Line; … There are now over 200, 1914-18 war casualties commemorated in this site. Driver A Hodgeson from the same company, who was originally listed as killed on the same day, was later recorded as killed in action two days earlier on 25 September, and was buried next to Horace Tilley. His death was recorded in the Rugby Advertiser and also in the Birmingham Daily Post. TILLEY – Killed-in-action in France on September 27th, 1918, Gunner HORACE A. TILLEY, R.F.A., aged 20, elder son of Mr. & Mrs. A. H. Tilley, 46 Railway Terrace, Rugby. Gunner Horace Tilley, Royal Artillery, son of Mr. A. H. Tilley, 46, Railway Terrace, Rugby, was formerly employed in the Controller’s Department at the B.T.H. His Medal Card [under the incorrect name George] showed that he was awarded the British War Medal and the Victory Medal. This article on Horace TILLEY was researched and written for a Rugby Family History Group [RFHG] project, by John P H Frearson and is © John P H Frearson and the RFHG, May 2018. Rugby Advertiser, 27 November 1915. Army Troops, 52 Army Field Artillery Brigade, 1917 Jan – 1919 Jan, Catalogue reference: WO 95/203/4. With thanks for location information provided by: https://www.greatwarforum.org/topic/261539-army-field-artillery-brigade-52-brigade-rfa/. Rugby Advertiser, Saturday, 12 October 1918. Birmingham Daily Post, Monday, 14 October 1918. Reginald Frederick COVINGTON was born in Northampton in about 1894, and his birth was registered in Q1, 1894. He was the son of George Frederick Covington, born in about 1861 in Northampton, and Kate, née Westley, Covington, who was born in about 1867 in Sherrington, Buckinghamshire. They had married on 25 December 1890 at St Michael and All Angels church, Northampton. Before 1911 they moved again, to Rugby, and Reginald attended school at St. Matthew’s. He had been a holder of the Robertson Cup for the best all-round athlete in the school. When Reginald was 17, the family were living in a six room house at 28 North Street, Rugby. He had two younger sisters. His father was a ‘Fruitierer & Confectioner’, and he was working as a ‘Compositor’ – later he would work for the family business and managed his father’s branch shop in Lawford Road. It is uncertain when he joined up, although an obituary stated that he ‘… joined the army … in the early days of the War.’ He joined up as a Gunner, No.1160, in the Royal Field Artillery – Territorial Force, and at a later date, but prior to September/October 1917, he was renumbered as No:840787. It seems that he did not go to France until at least late 1915, as he did not receive the 1914-1915 Star, but he was certainly in France prior to September/October 1917, as he was wounded and/or gassed as mentioned in two local papers. Roll of Honour, Coventry and District Casualties. Wounded … Covington, 840787, Gnr. R., Rugby, R.F.A. An official Casualty List in October also listed him a ‘Wounded’ under the Royal Field Artillery listing. It seems that he was sent back to England for treatment, but returned to France in about early 1918. The CWGC record states that he was latterly in the ‘D’ Battery of the 275th Brigade, Royal Field Artillery. The 275th (1/1st West Lancashire) Brigade RFA Territorial Force was based at Windsor Barracks, Spekeland Street, Liverpool. The Brigade came under the orders of the West Lancashire Division. The divisional artillery crossed to France, landing at Le Havre on 1 October 1915. The West Lancashire Division, now titled the 55th (West Lancashire) Division, was ordered to re-form in France and the artillery rejoined it at Hallencourt between 2 and 4 January 1916. A new “D” Battery was formed for the Brigade on 7 May 1916. There were later various reorganisations as the batteries were switched around. In 1918, the 55th Division relieved the 42nd (East Lancashire) Division in the front line at Givenchy and Festubert on 15 February. Here, it faced numerous strong enemy attacks in March 1918. Early April was comparatively quieter, but it was a lull before a storm, with the Division involved in the Battle of Estaires (9-11 April) including the Defence of Givenchy (9-17 April) and the Battle of Hazebrouck (12-15 April), the latter two being phases of the Battles of the Lys. The Defence of Givenchy was to become the single most famous action fought by the Division. ‘It was afterwards publicly stated by an officer of the German General Staff that the stand made by the Division on April 9th and the days which followed marked the final ruination of the supreme German effort of 1918’, says the Divisional history. The 275th RFA Brigade Diary gives information on their various actions in April and May, but there do not seem to be any specific large scale actions at and just before Reginald died of his wounds. The 275th Artillery Group was in the line in early April and on 9 April, the ‘B’, ‘C’ and ‘D’ Batteries of the 275th were moved back section by section. On 10 April there was considerable hostile bombardment which included about 10% of gas shells of various types. In spite of attacks, it seems the German advances on Givenchy and Festubert were driven back and indeed some 700 prisoners were taken. On 25/26 April, the 164th Infantry Brigade attacked Givenchy to re-establish the old line. The 275th put down smoke and shrapnel to cover one of the flanks. The 55th Division were congratulated on their fine work during this battle. There is less information recorded for May, and Reg was probably wounded, possibly by German counter-battery shelling, sometime in April or May. If earlier, he might have been expected to have been evacuated further to a base hospital, so it was probably about mid-May. Reginald’s Medal Card states that he ‘Died of Wounds’ on 22 May 1918 and the Army Register of Soldiers’ Effects stated that he died at the ‘2/1 Wessex Field Ambulance’, France. Their movements may provide some further information on Reginald’s location. The 2/1st Wessex Field Ambulance, was largely a Devonshire unit but was attached to the 55th West Lancashire Division from January 1916 to November 1918. In April 1918 they were in the area La Basse/Givenchy and near Bethune on 9 April 1918, and had an Advanced Dressing Station just behind Givenchy during the German attacks of April 1918. The RAMC War Diary for the 55th Division provides details of the movement orders for the 2/1st Wessex Field ambulance, and during the month they were moved to some ten different locations in response to the German assaults. During May the 2/1st Wessex Field Ambulance quartered around Drouvin, and it seems likely that Reginald died of his wounds at the Field Ambulance there on 22 May 1918 and was buried in the nearby Houchin British Cemetery. His body was buried in grave ref: I. B. 18. Later, when a permanent gravestone replaced the temporary cross, his family’s message, ‘Though Far Away to Memory Ever Dear’ would be inscribed upon it. Houchin is a village situated between Barlin and Bethune, about 5 kilometres south of Bethune. Houchin British Cemetery was opened in March 1918 when the 6th Casualty Clearing Station came to Houchin. From April to September the German advance made Houchin unsafe for hospitals, and the cemetery was used by the 55th (West Lancashire) Division. Gunner Reginald Covington. Mr G F Covington, of North Street, has received news that his only son, Gunner Reg Covington, R.F.A. died of wounds received in action on May 22nd. 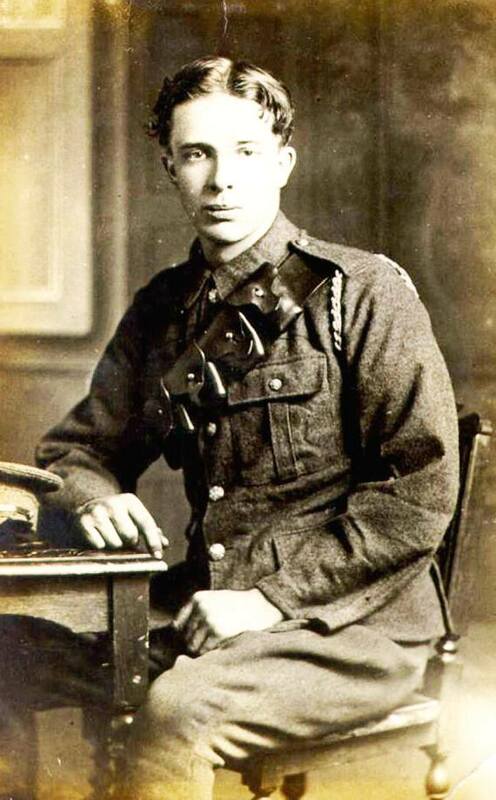 He was 23 years of age, and joined the army – prior to which he managed his father’s branch shop in Lawford Road – in the early days of the War. Towards the end of last year he was badly gassed, but he returned to France a few months ago. An old St. Matthew’s boy, he was at one time the holder of the Robertson Cup for the best all-round athlete in the school. An official Casualty List in July also confirmed that he ‘Died of Wounds’ under the Royal Field Artillery listing. Reginald Frederick COVINGTON is also remembered on the Rugby Memorial Gates. His Medal Card showed that he was awarded the British War Medal and the Victory Medal. His mother, Kate, as sole Legatee, received his back-pay of £6-7-1d on 28 August 1918, and his War Gratuity of £13-10s on 9 December 1919. This article on Reginald Frederick COVINGTON was researched and written for a Rugby Family History Group [RFHG] project, by John P H Frearson and is © John P H Frearson and the RFHG, February 2018. Rugby Advertiser, Saturday, 1 June 1918. This would seem to be in error, there are no other Reg Covingtons with a father Richard. https://rugbyremembers.wordpress.com/2017/09/29/29th-sep-1917-blackberry-picking/, and Rugby Advertiser, 29 September 1917. Coventry Evening Telegraph, Friday, 19 October 1917. Weekly Casualty List (War Office & Air Ministry), Tuesday, 23 October 1917. 2/1 Wessex Field Ambulance, a file is available at TNA ref: WO 95/2919/1, 1916 Jan. – 1919 Apr., and various information can be found on Google. Coventry Evening Telegraph, Thursday, 27 June 1918. Weekly Casualty List (War Office & Air Ministry), Tuesday, 2 July 1918. George Frederick CHANT was born on 28 January 1880, in Enfield, Middlesex, the son of Anthony Chant, a coachman from Yeovil, Somerset, and Ellen, née VALE, Chant who was born in Westminster. George was baptised on 20 June 1880 at the Enfield Jesus Chapel, Enfield, when the family was living in Turkey Street. In 1891 the family were living in ‘the cottage’ in Enfield, apparently not far from the ‘Spotted Cow’ beer house. The family seems to have remained in Middlesex, but George was elsewhere and has not been found in the 1901 or the 1911 censuses. However, it seems that he was one of the many workers who came to work in Rugby at the expanding British Thompson Houston (BTH) works in the years before the war. Thomas moved to Rugby and went to work in the BTH Stores. He married with Alice E. Welch, the marriage being registered in Rugby in Q2, 1915. They later lived at 43 Union Street, Rugby. At some date, possibly somewhat later in the war, he joined up in Rugby as a Driver, No.88840 in the Royal Field Artillery. There is no surviving Service Record, so the details of his service are unknown – and being in the Artillery it is less easy to plot his progress. His Medal Card shows him in the Royal Field Artillery but there is no qualification date for when he went abroad, so it was probably in 1916 or even later. In March 1918, he was serving with the Royal Field Artillery, at the Headquarters, 4 Corps. However, on 21 March 1918, the Germans launched a major offensive, Operation Michael, against the British Fifth Army and the right wing of the British Third Army. The German artillery targeted command and communications; then, the destruction of artillery; and then the front-line infantry. The artillery bombardment began at 4.40am on 21 March 1918, and hit targets over an area of 150 square miles, the biggest barrage of the entire war. Over 1,100,000 shells were fired in five hours. Whilst the first bombardment of artillery positions was on 21 March, artillery attacks continued and George Frederick CHANT was ‘killed in action’ on the third day of the battle on 23 March 1918, aged 23. Because of the intensity of the battle, with the Germans moving forward in strength, and in the confusion of the retreat and rearguard action, the bodies of many of those killed were never found or identified. George Frederick CHANT is remembered on Bay 4 of the Arras Memorial which is located at the entrance to the Faubourg d’Amiens Cemetery in France. The memorial commemorates almost 35,000 servicemen from the United Kingdom, South Africa and New Zealand who died in the Arras sector between the spring of 1916 and 7 August 1918, the eve of the Advance to Victory, and have no known grave. [One of the] … most conspicuous events of this period … was the German attack in the spring of 1918. THE ROLL OF HONOUR. Coventry and District Casualties. George Frederick CHANT is also remembered on the Rugby Memorial Gates, and his name appears also appears as ‘CHANT G F’ on the list of ‘BTH Employees Who Served in the War 1914 – 1918’; and as ‘CHANT George F’ on the list of names on the BTH War Memorial when it was unveiled in 1921. His Medal Card showed that he was awarded the British War Medal and the Victory Medal. The Army Register of Soldiers’ Effects, 1901-1929 showed that his back pay of £1-16-2d was paid to his widow ‘Alice E’ on 25 June 1918, and then his War Gratuity of £17, in two payments: £5-13-4d on 27 November 1919 and £11-6-8d on 25 February 1920. This article on George Frederick CHANT was researched and written for a Rugby Family History Group [RFHG] project, by John P H Frearson and is © John P H Frearson and the RFHG, January 2018. Coventry Evening Telegraph, Thursday, 16 May 1918. The death in action of Lce.-Bdr. F. Ward, No.11115, (Rugby), who was also in the R.F.A., was notified in the same edition – he is not on the Rugby Memorial Gate. Taken from the list published in the Rugby Advertiser, 4 November 1921.